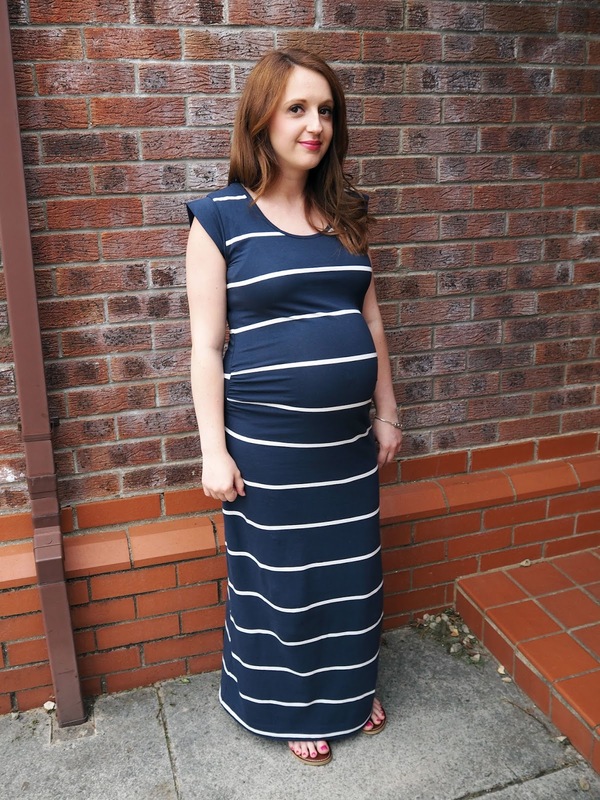 I received some beautiful maternity clothes from Yummy Mummy Maternity. I thought I would share them with you as if like me and you’re pregnant it is a nightmare to find clothes to wear. I have really struggled finding nice comfortable clothing and have been living in long tops and leggings and it becomes so boring dressing the same day in day out. It really is quite difficult dressing a growing bump! First I got sent a lovely swimsuit which is perfect and fit’s over my bump lovely. I was after a maternity swimsuit for a while as Josh really enjoys going swimming and I am no where near brave enough to wear a bikini while being pregnant so this was perfect. I love the colours used and the style and fit are lovely. The stripes are really flattering and a few of the pregnant ladies in the swimming pool asked me where it was from which is always a good sign. Next they sent me this lovely top which is really stretchy and goes over my bump with ease. I love the colour and material they used it really is such a comfortable top to wear and chuck over a pair of leggings or a pair of jeans.I love that I would still be able to wear this when Im not pregnant as its such a lovely fit that it would suit any body shape. The stretchiness of the material really is perfect to cover your growing bump and I have been living in this top for the last few weeks as my bump just keeps growing! It really is lovely for summer as it’s nice and light and flows lovely ensuring you stay nice and cool. The dress is by far my favourite. I love it so much! I have had so many compliments when I wear it as its the perfect maxi dress. The fit is perfect clings to all the right areas and really accentuates your growing bump in the loveliest way. I love the stripes I think they are so flattering and the colour is lovely too. In the last few days we have had lovely weather and I have practically been wearing this every day as its so easy to chuck on and keeps you nice and cool while still looking lovely. The material yet again is so stretchy so I know it will last my entire pregnancy, but I am still really excited to be able to wear it afterwards too and I think it will be my going home outfit in hospital if the weather is nice. 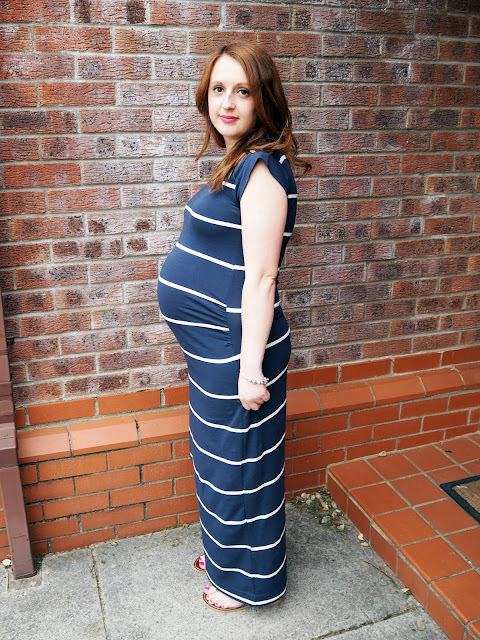 I love the maternity range this website has to offer and would recommend them to any pregnant lady who are after affordable, comfortable but most importantly lovely looking clothes to wear. Pregnancy is hard enough without having to struggle to find something that fit’s and looks nice so I love coming across websites like this and I really did have to share them with you. Did you find it hard to dress your growing bump? I certainly have!